Discussion in 'Mac and PC Games' started by bounou, May 15, 2014. Has anyone compared the difference between a Mac Pro with D700's and an iMac with a GTX 780M as far as gaming results are concerned? Just curious as to what kind of performance difference you can expect to get between the 2 systems using windows under bootcamp. I know that neither of these are strictly speaking gaming machines but since i am sure they are often used for it i was curious what kind of bang for the buck they give. This my two D700's under windows. There are also better drivers for them now, and Mantle support for BF4, and Thief. If the game utilizes Crossfire, I could see the D700's being better. But for games that don't take advantage of Crossfire( like X-Plane), the 780M will most likely be better. so even under os x its twice as fast. my guess is the d300 probably is the closest to the imacs 780m. This isn't anything to do with either of the GPUs mentioned, but the benchmark picture above sparked my interest, so I ran the same thing on my Hackintosh under Windows 8 to compare. This is what you get from a last-gen i7 and two cheap 2 GB GTX 670 cards - not that far off the Mac Pro! I haven't overclocked the 670s so there's room for improvement here. Would be curious to see what the results would be for an iMac with a GTX 780M, what benchmark are you guys using? Do you guys OC your cpu and gpu's? Last time I bothered with that was when I build a liquid cooled system with a Phenom II and 4870X2 in around 2009? Damn, it's been ages haha. I might one day bother again, although that system ended up costing me over €3000+ at the time as well. It ended tragically when the power cut and killed the pump, frying the GPU. It's now been relocated to a new chassis, with a simple AMD 6670, and serves as my mothers's internet/email machine. Pay very close attention to the tests, only the blue bars are in Windows with XFire.The first two. All other tests are in OSX where only a single D700 are used. Edit: I found some benchmarks for iMac / 780M. It's not too bad, considering the results in this thread are for multiple GPUs. Here are the ones that correspond to the results above (they also ran the 'extreme' test, which you have to pay for). Red bar is the 780M, green bar is an iMac with integrated graphics. My CPU is running at 4GHz, the GPUs are not OC'd. I didn't check out the fps graph but I noticed the counter at the bottom of the screen hitting 1400 fps. Your 3 x 780s are probably so fast, they broke the test! Maxed out the fps and broke through the other side. 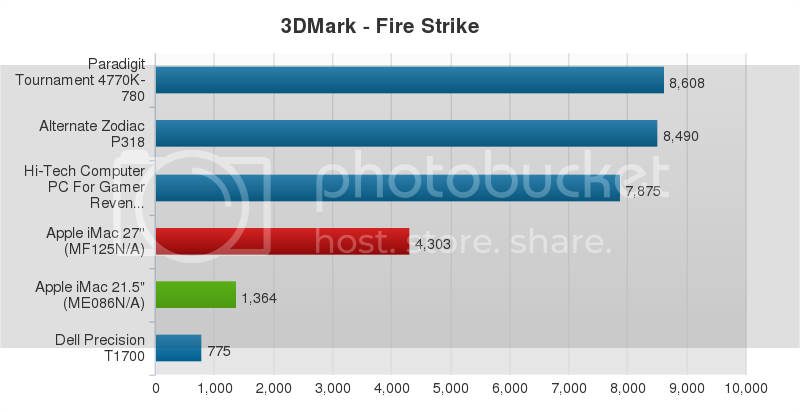 So fire strike numbers the 780M is 40% of the D700's and the cloud strike are 68%. How does that translate to real life performance? I know and it's still a bit better than the iMac with the 780M. Though the iMac is the better X-Plane computer. What is X-Plane, something like flight simulator? I always hear people here ask about it. Ive never actually played it. Yeah it is a flight simulator. IMHO, the best one out there. FSX has the plugins and developers( I am used to it being a Mac person ), but it doesn't have a very realistic flight model. It's also a dead product. There is Prepar3D made by Lockheed Martin, but that is FSX underneath since MS sold FSX to Lockheed. A license costs $200($60 for academic users), but none of the licenses cover consumer gaming. So technically buying P3D would be illegal, but Lockheed doesn't check. X-Plane has a very good flight physics model. The plane will fly fairly close to the real thing. FSX and P3D may have the eye candy, but X-Plane has what matters most, IMHO which is a realistic flight model. 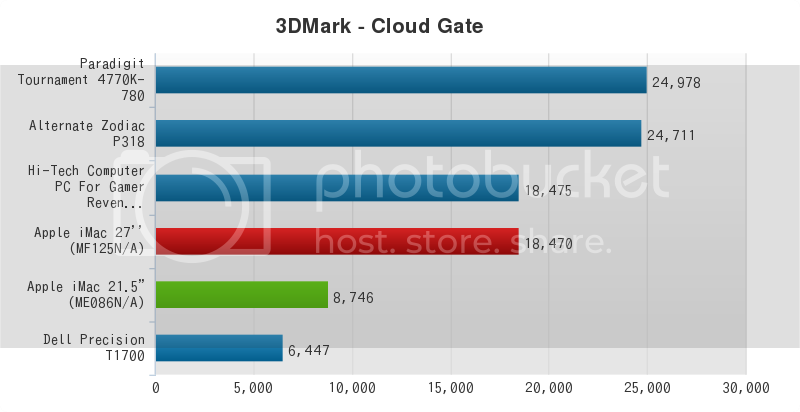 It's rather bizarre, but highlights how silly synthetic benchmarks can be. 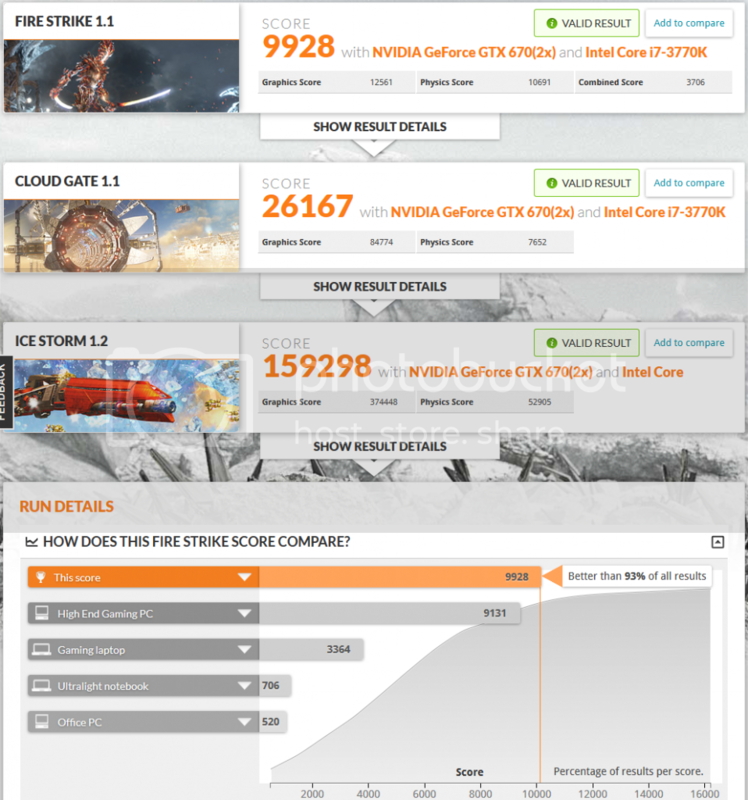 No way the GTX 670's should should be beating triple 780's, but it does. So when are you moving towards triple 4K displays? End of the month? I seen a benchmark software made just for Mantle on Steam the other day. I was about to purchase it until I read it was made for mantle. You should check it out see how your AMD cards do. I notice most of the benchmark software favor NVidia cards in your video. I haven't actually even tried anything in Windows since I did those videos, and the test. Since then I have seen that the Dxxx cards apparently got a big performance boost, and especially for mantle. I'll probably have to have a look. You're right about the tests I ran. It's not that they specifically favour NVIDIA, it's more down to NVIDIA having better OpenGL drivers. AMD have been sorely lacking in the area, and the last time I contacted the Khronos group, they stated that AMD do not comply with their latest OpenGL standards. One would hope with the increasing prevalence of Linux, and especially professional 3D software using OpenGL they'd sort out their drivers. They're always a step behind on it, and I think with Mangle, their drivers teams are even smaller now. One interesting thing is that OpenGL performance in OSX, and Linux is better than Windows for both NV, and AMD. We can see where their efforts went there ( DirectX ). Do you have the name of the benchmark on steam? I'll certainly have a look. I tried to look for it in the Steam app on my iPad and couldn't find it. I don't know the name off the top of my head, but search under Software for benchmark programs. There aren't a lot, so if you see something new there... that's probably it. If you can't find, I'll look for it when I get home and PM you. Well, you can't really say it translates to exactly x% difference in every application. Only that it's 40% in this benchmark and 68% in another. But as a general indicator of performance overall, it's a useful indicator. You could maybe expect a typical game to run on a single 780M at half the framerate it does on two D700s. If it's bang for your buck that you're looking for, maybe you could say that an iMac with a single 780M is a more cost-effective games machine than a Mac Pro. But if you can afford it then the Mac Pro comfortably outperforms the iMac. Not exactly unexpected, really. Also, a Windows box beats either, at high end or mid range. Yup, the older GTX680m performed around the same as a desktop GTX660. So I'd assume the GTX780m is around GTX760 performance. While the D700's are roughly 5-10% slower than the AMD R9 280X depending on games. While often better at workstation tasks due to drivers. In either case you can download either FirePro drivers, or Catalyst ( gaming ones ). Although performance is different for either in their respective tasks. Also if you're looking JUST for a gaming system, and I see the OP already has a MBP, they can easily get an M-ITX or full desktop windows machine since they'll be gaming in bootcamp anyway. Unless they planning on selling the MBP for the iMac/MP. For the price of either, and even less you can get a decent Windows system for games only. Very interesting about X Plane. I use both X Plane 9 and 10. I will post my experience later with the computers I built just for X Plane. I would like to hear about your experience with X Plane. I built a computer with top of the line quad Core i7-920 hardware with 6 GB RAM 4 years ago. My main reason was to fly X-Plane 9. I installed Snow Leopard on one HD and Windows 7 Home 64 Bit on another HD. The GPU is a GTS 250 with 1 GB memory, a moderately high end unit at the time. Geekbench 2.2 on Snow Leopard is 8500 & on Win 7 it is 7000. Now running X-Plane 10 at KSEA flying the Cessna 172, the frame rate with Win 7 is a little more than double what Snow Leopard delivers. All settings are exactly the same on both instances. I have read that Windows is better for X-Plane than Mac OS, but I was surprised at the difference. Just a few days ago, I built a computer with quad Core i7-4770k, 16 GB RAM and a GTS 250 GPU that I had laying around. It is running Windows 8.1 Home 64 Bit. Geekbench 3 is 14000. I am surprised that it does not run X-Plane 10 much faster than my 4 year old computer, all settings exactly the same. I had considered a new Mac Pro for X-Plane 10, but read that the computer I built would be more suitable. How much benefit would there be if a GTX 770 or 780 is installed in the new machine? A burning question: I purchased Win 8.1 OEM and Microsoft keeps popping up a window saying the software is not registered and to purchase a key for Win 8.1. But in order to finish the Win 8.1 installation, I had to provide Microsoft with my email address so they could email me a code to complete it. I entered the code and completed the installation. I have read about others having the same situation spending hours on the phone with Microsoft and the vendor that sold them the software. What is the solution? A faster CPU doesn't help if the GPU is bottlenecked. I went from a GTX285 to a GTX660 to a GTX780 on my i5-2500k@4.3GHz. All GPU upgrades helped a lot (I bought the GTX660 just to wait for next gen, when my GTX285 started to have issues after being carried over from an old build). A GTX770/GTX780 from a GTS250 will be 3-4 times the FPS in most cases, unless CPU is bottlenecked. I was also wondering if X-Plane 10 runs slower on Win 8.1 than Win 7 with the same computer. In my case, the new computer is almost twice as fast (according to charts) as my older unit, but the new computer with Win 8.1 does not give many more fps than my older unit with Win 7.